I like Sandown! There’s room to move and less hugger-mugger. And at this time of year the weather is perfect, not too hot, not too cold. 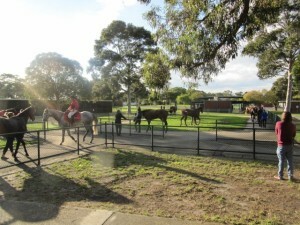 And then there’s the lovely autumn light out at the pre-parade ring. And every horse has a chance as long as you keep away from the inside. When I’m waxing lyrical like this you know I’ve had a very good day! But it didn’t start off so well. My poor run with two-year-olds continued with the nice and relaxed River Goddess getting nutted for third right on the line. How I hate kicking off with a loser! That must be my third or fourth fourth with the babies in the last few weeks? However, things soon improved with Kav’s Tears of Joy coming to the rescue and then Hard Romp snatching third. I saved the best for last with Bengal Cat steaming home in the three-year-old fillies. Thank goodness John Sadler had walked the track and instructed his son to go wide! I found the time to add to my video library of bad behaviour with that old rogue Fab Fevola circling in the yard and showing some nice heels. This horse is the fastest horse in Australia, if not the whole wide world, over 900 metres. He is always super-aroused and sports plenty of gear – today just the tongue tie, nasal strip and hoof pads. The horse went like a bat out of hell and led them up until punctured, as all the wise old lags predicted, at the 880 metre mark, and faded to finish last. The train ride home is always interesting. I overheard a new line in begging: “Excuse me mate, could you ring my brother? I’ve run out of credit!” Usually it’s just “Could you spare a few coins?” I quickly hid my phone! And a housekeeping matter. I’ve been wondering for some time why there were no comments on the blog and just assumed that nobody bothered reading it. I asked my webmaster who looks after the site and he found over 5000 comments pending! I thought he checked them and he thought I checked them! So I trawled through and found a few legit ones, which I have reinstated, amongst all the spam. So feel free to comment again so long as you are not trying to sell me Ugg boots, Viagra or an iPhone6! On my Foxtel recording of Racing.com (channel 522) I noticed that River Goddess was dumping behind the barriers. Watching More Racehorses mentions such horses as doubtful betting propositions, which might have been significant. Maybe Geoffrey’s bad run with 2-year-olds has something to do with young horses still getting nervous behind the barriers. Who knows? At that stage most of us would miss this behaviour anyway because we’d be trying to get our bets on. I would have cancelled my bet!